I hope you’re having a great, book-filled week. I #amwriting. 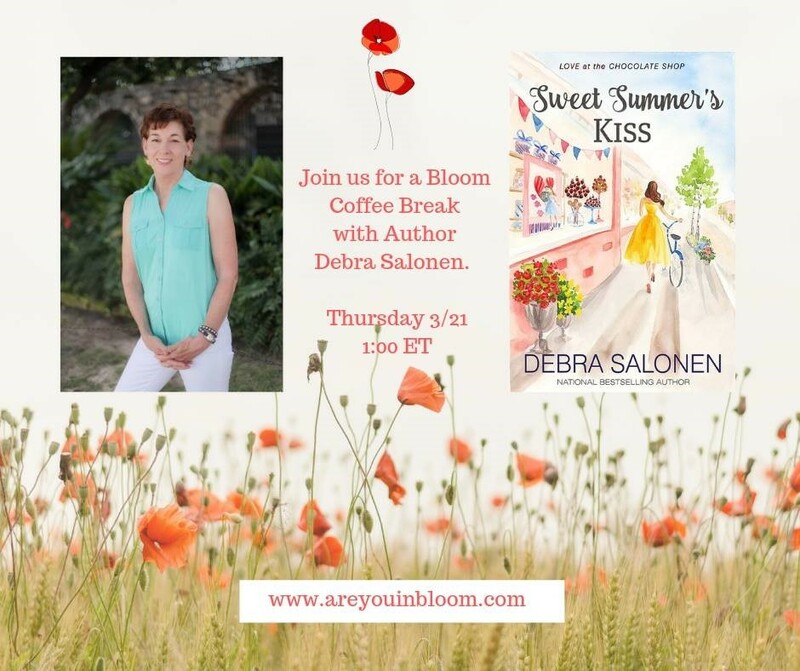 Which means I don’t get out much, but a friend invited me to a coffee chat at Bloom With Tall Poppies Facebook group on Thursday at 1 PM EST. I’ll be giving away a print copy of one my books. A storybook kiss on New Year’s Eve at the Big Sky Mavericks Masked Ball in Marietta, Montana should have been the beginning of a grand romance for Gretchen Zabrinski and Daniel Andrews. But when Gretchen overhears a phone call from Daniel to his brother about what he really wants from a woman, she takes off…without leaving so much as a glass slipper behind. Daniel wants a family. Gretchen will never be able to give him that. So why does fate keep throwing them together so cruelly? First, at a Copper Mountain Chocolate Shop Speed Dating event, then when he’s hired to open a new division at her PR firm. But competing, shoulder-to-shoulder, to sell the most exotic chocolate kisses for charity really is the last straw. Is love a cosmic connection or a karmic joke? Sometimes, the answer reveals itself in a kiss—a sweet kiss shared beneath a warm Montana summer sky. He’d alluded to a sad mystery surrounding his late brother-in-law’s death, but there were too many getting-to-know-each-other topics to get into any one conversation too deeply. Including her reason for dropping out of college and moving to Montana. That would come out later. After the music ended. After the countdown began. After their kiss. After a night of unimaginable bliss in each other’s arms. She crossed her fingers and stopped thinking. Tonight was about feeling. About taking risks and experiencing life to the fullest. Moments later, the DJ played an Ed Sheeran song Makayla had shared with her earlier that week. Perfect. A shiver ran down the length of her spine. She’d immediately downloaded the song and added the video to her playlist. She imagined the love story he sang about was her love story—the one that never happened. She squeezed her eyes tight, wishing she still wore a mask. She recognized the designer’s name even if she hadn’t recognized the brand on his feet. My first time is going to be with a guy who can afford designer shoes. Gretchen turned in Daniel’s arms so their fronts were pressed together. Reaching up, she slipped her fingers under the rim of his mask and pulled it free. They looked into each other’s eyes as what she hoped was an unspoken understanding passed between them. His lips were warmer than she’d expected. And softer. And when she gave a little “Oh,” his tongue slipped inside her mouth. Curious, friendly, interested. His taste was hers. His smell? Completely his own and something she’d forever identify as Daniel Andrews. She melted against him, needing to touch as much of her body to his as possible. Gretchen wanted him to be the one. Her first. From what she’d learned about him on social media, he was a fun-loving go-getter who didn’t seem the least bit interested in settling down. When it came to women, he was…um…experienced. Perhaps a bit of a player. She wanted to be with someone who would treat her with gentle finesse…or maybe not-so-gentle finesse. How would she know what she liked until she tried it? An unnatural buzzing sensation near her breast made her startle. Daniel rolled his eyes, but he took one step back. He lowered and raised the phone as Gretchen did a spin. Then, he pulled her in close again. Gretchen missed Daniel’s reply when Sarah Zabrinski walked up to them. “Aunt” Sarah was Gretchen’s father’s first cousin by marriage, but because of their age difference, people forgot they were part of the same generation. Tomorrow. Since she’d never spent the night with a man, she didn’t know what to expect from the morning after. Gretchen made what she hoped was a noncommittal reply and waved goodbye as the crowd swept Sarah away. She sucked in an involuntary gasp when a pain as sharp and gut wrenching as the one she’d felt in her doctor’s office the day he’d explained the ramifications of her diagnosis made her knees wobble. Panic hit a second later. No. No. It’s not supposed to be like this. Tonight is mutual fun, no commitment. No future. Period. Anything else wouldn’t be fair. But she couldn’t speak those words aloud because then he’d ask why…and she hadn’t said those words to anyone. Not yet. Intent on disappearing, she turned and melted into the crowd exiting the party. She grabbed her jacket from the coatroom, grateful her tiny purse held her cell phone. Her Uber app showed one driver in her area. Three minutes later, she was on the road back to Paradise. Her sister and niece might not be expecting her, but Sam would understand. And that was all Gretchen wanted. Someone who wouldn’t ask for something she couldn’t give. Thanks, Amy! Happy Hump Day!! !